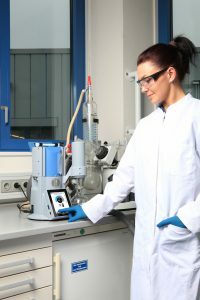 21.05.2018 The Vacuu•Select interactive vacuum controller from Vacuubrand offers a new operating concept for all typical vacuum processes in chemistry labs. A graphical user interface with touchscreen display allows for simple and intuitive data input. The Vacuu•Select controller offers predefined procedures for all common vacuum applications, which can be started or modified via an intuitive touchscreen interface. The application editor allows for easy drag and drop customization and enables the user to save favorite processes. Chemistry vacuum pumps often have to handle aggressive chemicals. The vacuum controller is therefore made of robust chemically resistant materials, yet the glass touchscreen is still sensitive enough to be operated in the laboratory with safety gloves. The complete standalone controller can interface with existing vacuum source and comes with one of the manufacturer’s diaphragm pumps, most effectively with a speed-controlled Vario pump offering fully automatic evaporations at the touch of a button and the shortest process times without foaming. The controller works not only with diaphragm pumps, but with all vacuum sources. Package solutions are available for fine vacuum control in applications such as freeze drying or use with Schlenk lines, which need a deeper vacuum than 1 mbar.